Staying at Lava View Lodge Hotel when Visiting Mount Bromo. Lava View Lodge is located in Sukapura, Cemoro Lawang, Probolinggo. 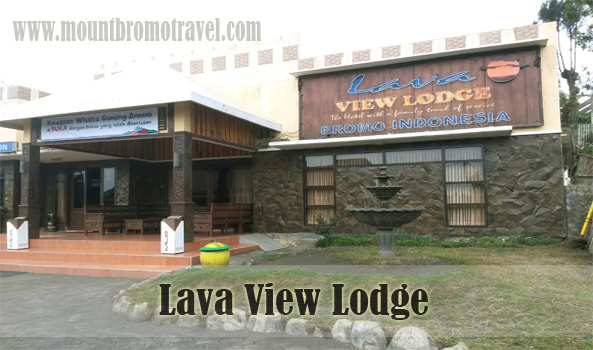 This Lava View Lodge is one place you can stay the night when visiting Mount Bromo. You can book rooms in this lodge on the spot when you decide to stay the night. But it’s best to book the rooms few weeks in advance to make sure you will have a place to stay at night. The view is the main appeal of this lodge. Who doesn’t want a view of an active volcano smoking from their window? Combine that with the sunrise every early morning and the fresh air of the mountains. Other facilities are just bonus compared to the view it has to offer. If you want a closer look to Mount Bromo, just ask the receptionist to rent a jeep for going up the mountain, and you’re ready to go. There are six types of room in the Lava View Lodge. The standard superior is the cheapest room for two. Inside the room you will have a coffee maker, 2 bottles of mineral water, a TV, and you can have hot shower. The rate is IDR 600.000 with breakfast included. Bungalow double room type is right for the couples in their honeymoon. The rooms are separated from the main building. The rate is IDR 700.000. If you are visiting Bromo with your friends, the bungalow triple is the room type for you. Just split the IDR 800.000 bill to three! The last 3 types of room are suitable if you have more money to spare. Inside those rooms, you can find a set of coffee table and a couch to relax and watch the TV while eating without spreading the crumbs to your bed. The deluxe room is suitable for two people and the family room and the cottage has enough beds for 4 people. From those rooms you will get the best view of the mountain. The sunrise you can see from here is worth every penny you pay for the lodge. The rate ranges from IDR 900.000 to IDR 2.500.000. The rates mentioned above are normal rates and you will be asked to pay more on high season (May to September) and on peak season (September to January). You will also charged if you bring extra person or if you need an extra bed. If you are looking for hotel with clear view to Mount Bromo and access to go to there, this is the right place for you. Don’t waste any time after you’re done with planning a trip to Mount Bromo, pick up your smart phone and book a room at Lava View Lodge.